We are happy to conclude National Volunteer Week with an official declaration from Governor Herbert recognizing Volunteer Week in Utah! This declaration not only recognizes Volunteer Week, but also commemorates UServeUtah’s 25th anniversary! You can read the full declaration below. Keep the celebration of Volunteer Week going all year! Pledge to Give 25 hours of service in 2019 to celebrate our 25th anniversary! Take the pledge here! Do you already serve 25 hours or more during the year? Pledge to give 25 more! We would love to recognize you for your service! 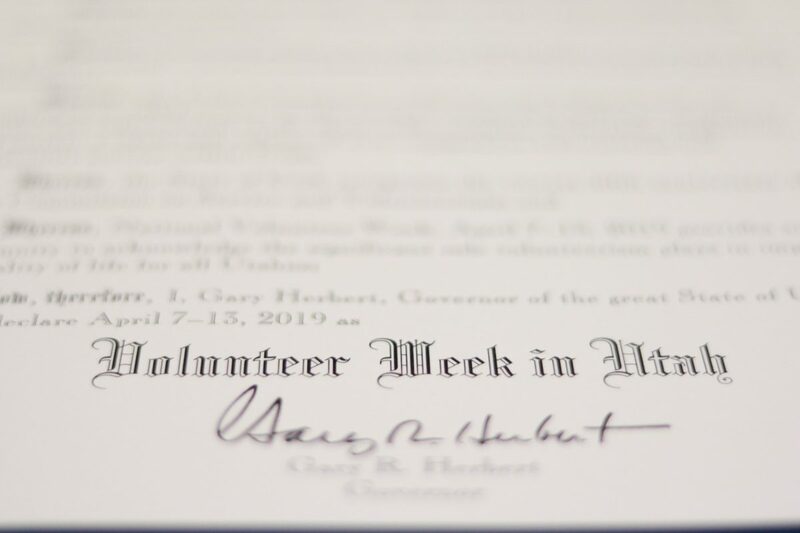 Now, therefore, I, Gary Herbert, Governor of the great State of Utah, do hereby declare April 7-13, 2019 as Volunteer Week in Utah.